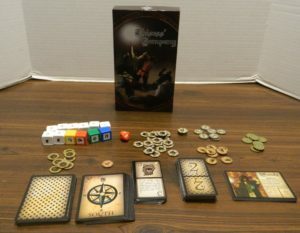 We would like to thank Fermented Games for the preview copy of Thieves’ Company used for this preview. Other than receiving the preview copy we at Geeky Hobbies received no other compensation. This preview is based off of a pre-release copy of the game so the rules or components may be tweaked before the final version is released. The King has decided to take a vacation and has taken many of his guards with him. Being a master thief your first thought is that this is a great opportunity to break into the King’s castle and steal all of his treasure. You and a group of up to three other thieves must work together to steal as much treasure as possible and escape before being captured by the guards left in the castle. Will your group successfully relieve the King of his treasure in an epic heist or will your group fail to escape with your ill gotten gains? Each player chooses which thief they will play in the game. The player takes the associated card, tokens and playing piece that belongs to that thief. 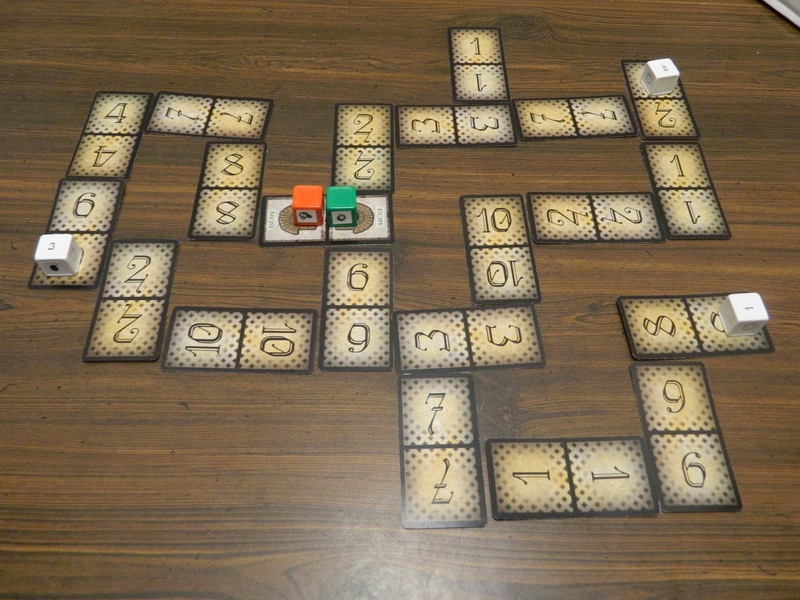 The players place the Escape Route card in the center of the table and each player places their pawn on it. Place the compass card on the table to indicate the different directions of the castle. The players roll the die to determine who will play first. Before the game begins the castle has to be built. Each player is given a certain number of castle cards based on how many people are playing the game. Without looking at the castle cards the players will assemble the castle by placing the cards (face down) like dominoes to form the different pathways of the castle. Players can place the cards however they want as long as the cards touch just one side of another card. No more than two cards can be placed end to end to create a hallway. 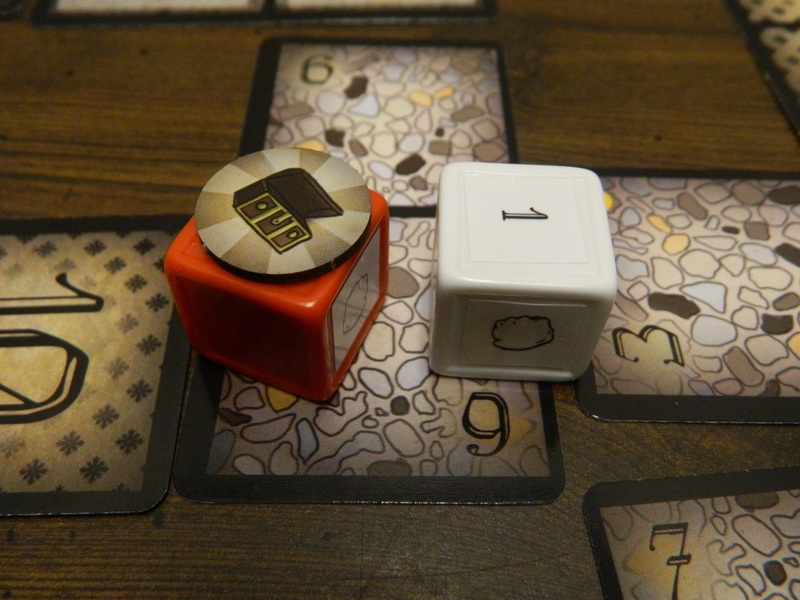 Guards are then added to the castle based on the roll of the die. The number of guards in the castle at the beginning of the game depends on the difficulty chosen and the number of players. Here is an example of how to setup the castle for a two player game. Thieves’ Company is broken down into two phases: the player phase and the guard phase. The game alternates between the two phases until the game ends. On each player’s turn they begin with three movement points. Each movement point allows the player to move one space in the castle. Players have to move at least one space on their turn but they don’t have to use all of their movement points. When a player ends their turn on a face down card, the player must immediately flip it over. If the card is a trap card the player must do a check by rolling the die to see if they tripped the trap. 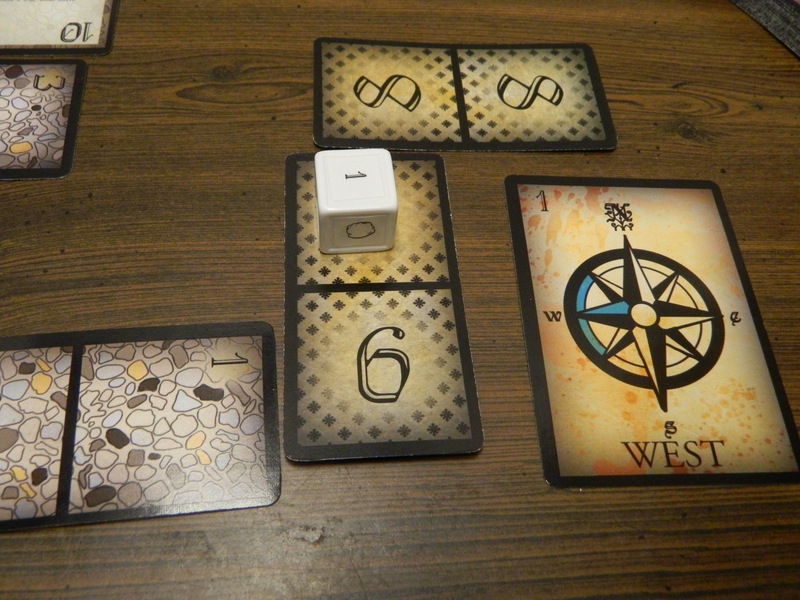 If the card has a yellow dot on it, a treasure token is placed on the space. The card that the red player landed on has a yellow dot on it which means that it has a treasure spot. A treasure token is placed on the spot and the red player can roll the die to see if they are able to pick it up. When a player is on a space with a treasure on it, they can perform a check to see if they are able to pick it up. If successful the player puts the treasure on their pawn and carries it with them. There is no penalty for the first treasure that a thief carries. The player loses one movement point for every additional treasure that they pick up. The player can at max carry three treasures. Once a player is carrying treasure they need to bring it back to the escape card. The red player is currently carrying two treasures towards the escape card. Since they are carrying two treasures they will have two movement points instead of three until they unload the treasure on the escape card. 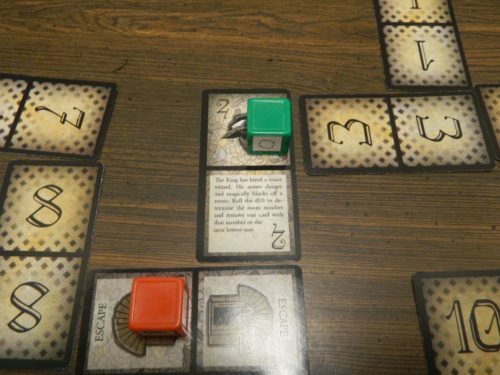 At any time during a player’s turn they can choose to use one of their thief’s abilities. When using abilities a thief has to use some of their ability tokens. These tokens can be retrieved from the board if the player moves back onto the space in a future turn. Each hero has a weaker (one token) and stronger (three tokens) ability. 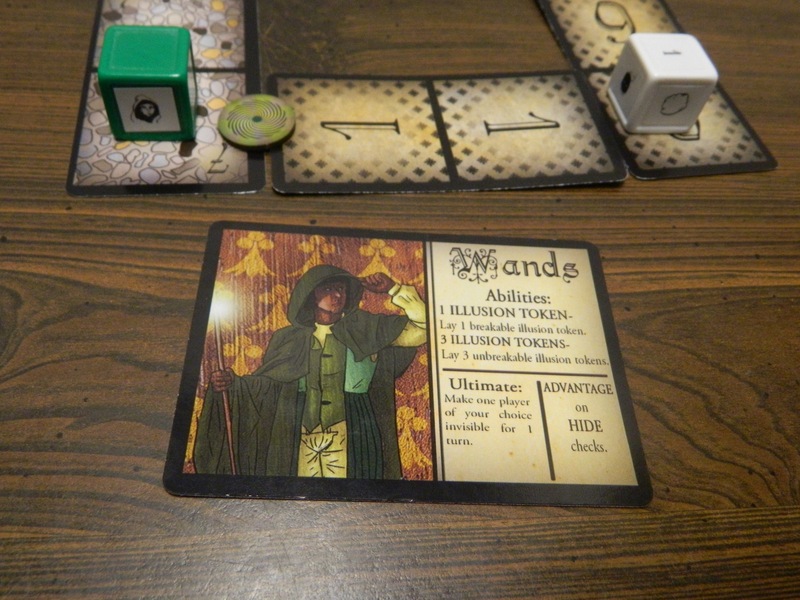 Thief of Wands: The Thief of Wands can create illusions that trick the guards. An illusion can be placed between two cards which will prevent the guard from seeing past the illusion until they move through it. This is helpful in blocking the guards from seeing the thieves behind the illusion. The Thief of Wands has decided to lay down an illusion. The guard is unable to see the Thief of Wands down the hallway because of the illusion. Thief of Swords: The Thief of Swords can knock out guards temporarily. If they sneak up on the guard they can knock the guard out for one or three rounds (depending on the number of tokens used). If the guard sees the Thief of Swords before they are able to knock them out, the Thief of Swords has to roll the dice to see if they are successful. 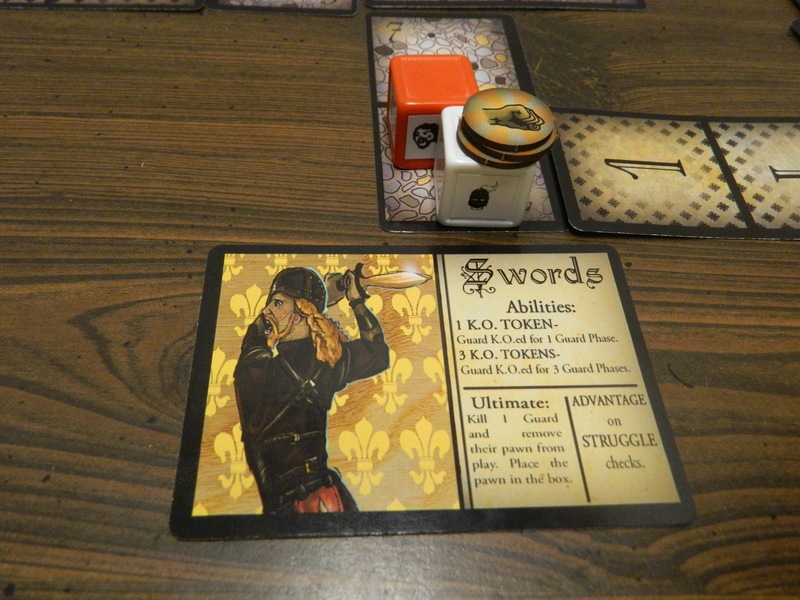 The Thief of Swords was able to sneak up on this guard and used their special ability to knock it out for three turns. 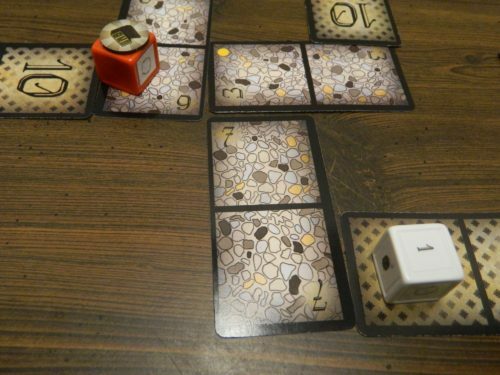 Thief of Coins: By using one token the Thief of Coins can lower the alarm track by one space. 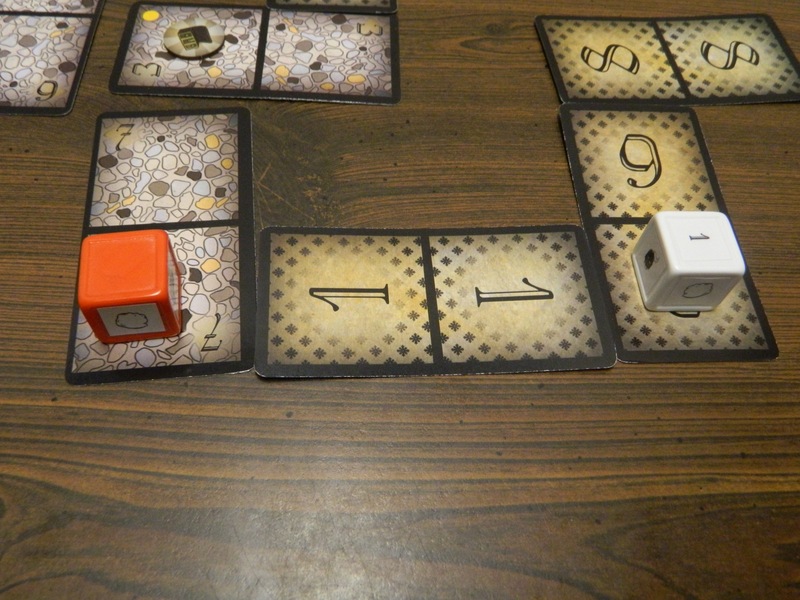 For three tokens the Thief of Coins can move a treasure three spaces in any direction. The Thief of Coins has used one of their tokens in order to reduce the alarm track by one notch. Thief of Cups: The Thief of Cups can play tokens in order to disarm traps found throughout the castle. Certain cards in the castle will have traps on them which require a player to pass a check in order to avoid what is printed on the card. By playing tokens on the card the players can freely move on the space without having to roll for the check. The Thief of Cups has used their special ability to disarm the trap that they are currently on. Wands: Make one player invisible for one turn. Cups: One player gets an additional three extra movement points on their next turn. Swords: Permanently remove a guard from the castle for the rest of the game. Coins: Teleport a treasure to any other card with a treasure icon on it. After all of the players have moved for the given round, the guards move. Starting with the lowest numbered guard, a card is drawn from the guard deck. Each card used to form the castle has a number on it. The guard card drawn will have a number on it so the guard will move towards the closest castle card with the same number. Each guard has two movement points that they use to move towards that card. 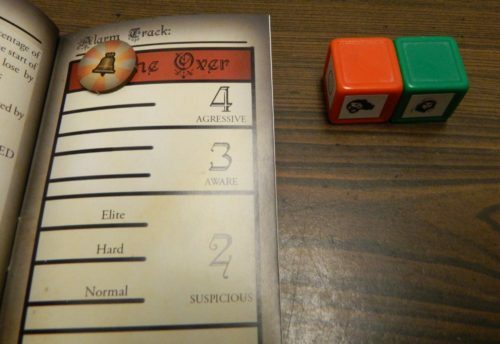 After moving the guard is turned to face the direction indicated on the card. Guard one started the turn on the far right eight space. The guard drew a one card so they move towards the one card. The guard will also face west after moving as indicated on the card. While moving or during a player’s turn a guard may detect one of the thieves. If a guard is looking in the direction of a thief and is within four spaces of that thief they will begin chasing them. The guard is looking at the thief and is within four spaces so it will begin pursuing the red thief. The guard will chase the thief until the thief has successfully hidden (moved out of the guard’s sight and passed a hide check). After the thief moves on this turn they will be far enough away from the guard in order to try a hide check (as long as they don’t move towards the guard). If successful the guard will no longer chase the thief. If a guard sees another guard chasing after a thief, that guard will pursue the thief as well. If a guard lands on a space occupied by a thief, the player controlling that thief will perform a check. If the player fails the check, their thief is killed and removed from the game. If the player succeeds they successfully escape being captured. The guard has caught up to the red player. 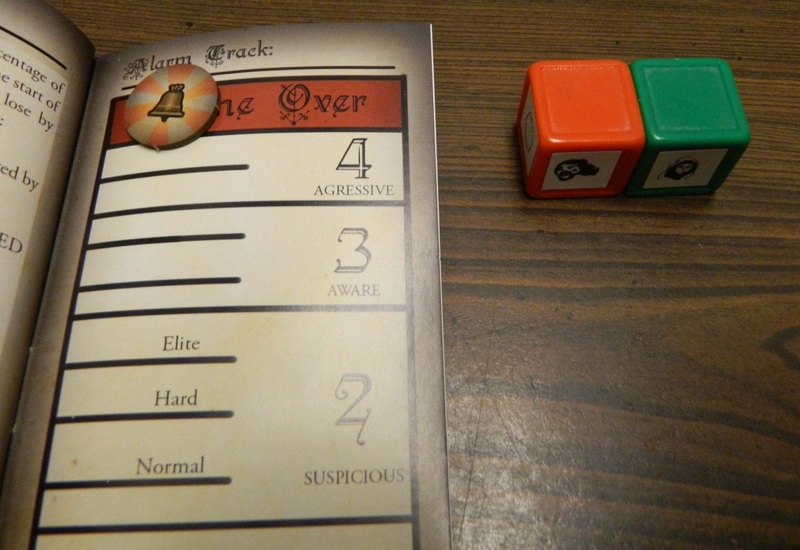 The red player has to roll the die to see if they can avoid being killed by the guard. Throughout the game the players will have to perform different checks to see whether they are successful in the action they tried to perform. Checks are performed to avoid capture, to avoid traps, to move onto spaces occupied by guards, to hide from guards, and to pick up treasure. Based on the thief chosen, players can either have an advantage, disadvantage or neutral standing for the roll. To be successful in a check the player has to roll a six or higher. This player has moved onto a trap card that hasn’t been disarmed. The player will have to roll the die to see if they avoid setting off the trap. 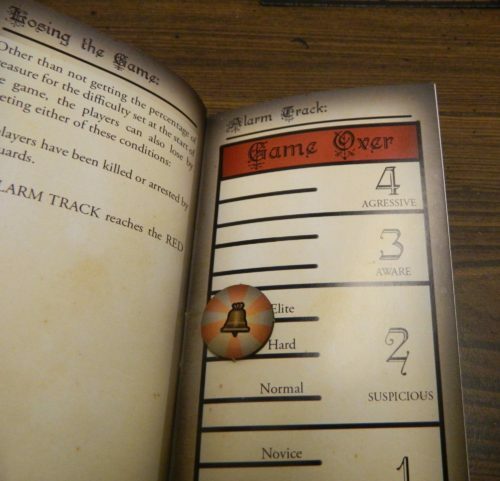 To start the game the castle’s alarm is set based on what difficulty the players chose. Whenever a guard detects a thief the alarm level is raised. As the alarm is raised, more guards enter the castle and they become more aggressive which makes them harder to get away from. The players are currently at the elite position on the alarm track. If the alarm ever reaches the top of the alarm track, the players lose the game. The game will end immediately if either all of the thieves are killed or the alarm level reaches the game over level. In this case the players will lose the game. The game ends when the alarm token reaches the top of the alarm track or all of the thieves are killed. Otherwise the players can choose to end the game whenever they want. 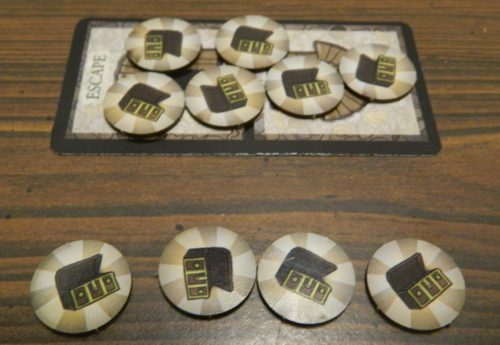 The catch is that in order to win the game the players need to get enough treasure back to the escape card. Based on the difficulty chosen the players need to get a designated percentage of the available treasure back to the escape card. When the players decide to end the game they flip over all of the cards that have yet to be flipped over. 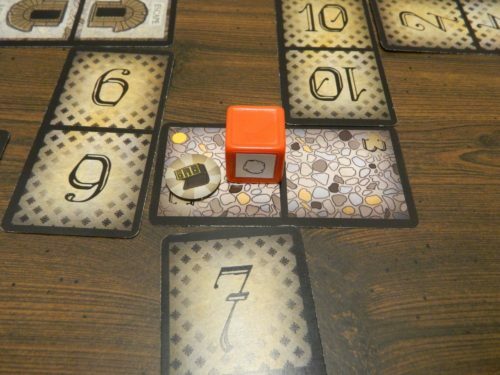 The players then compare the amount of treasure they were able to get back to the escape card with all of the treasure spaces in the castle. If the players got a high enough percentage of the treasure they win the game. If they didn’t get enough treasure, they lose. This group was able to gather six of the ten treasure tokens from the castle. I they were playing at the novice to hard difficulty they would win the game. If they were playing at the elite level they would lose the game because they had to acquire 80% of the treasure. One of my favorite board game genres is the cooperative game. While I enjoy competitive board games, I usually prefer a good cooperative game. There is just something satisfying about working with the other players to try and beat the game. 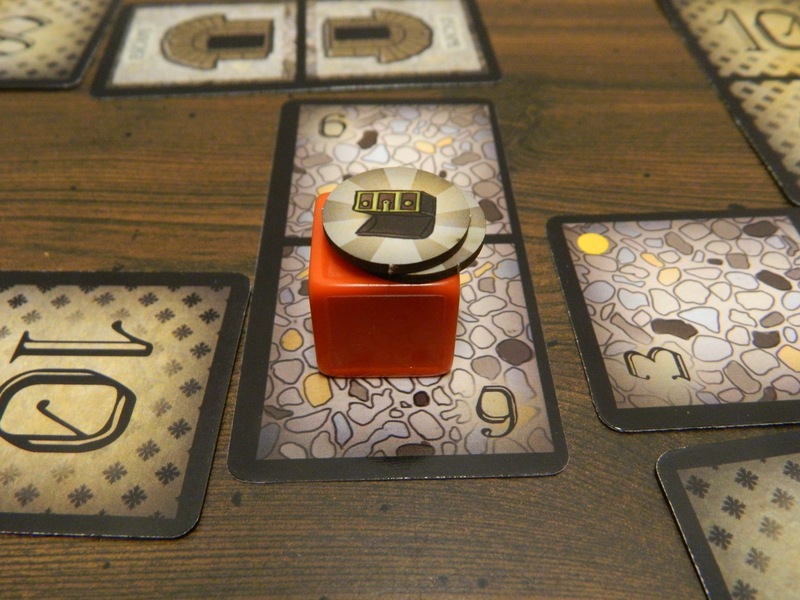 While the two games are pretty different, Thieves’ Company kind of feels like a more complex Forbidden Island. Basically in both games the players are working together in order to move around the board trying to collect treasure. In both games the players have a set amount of movement points and each character has a special ability that they can use to help out the group. Thieves’ Company kind of feels like what would happen if you took Forbidden Island and added an additional level of strategy as players try to avoid the guards. 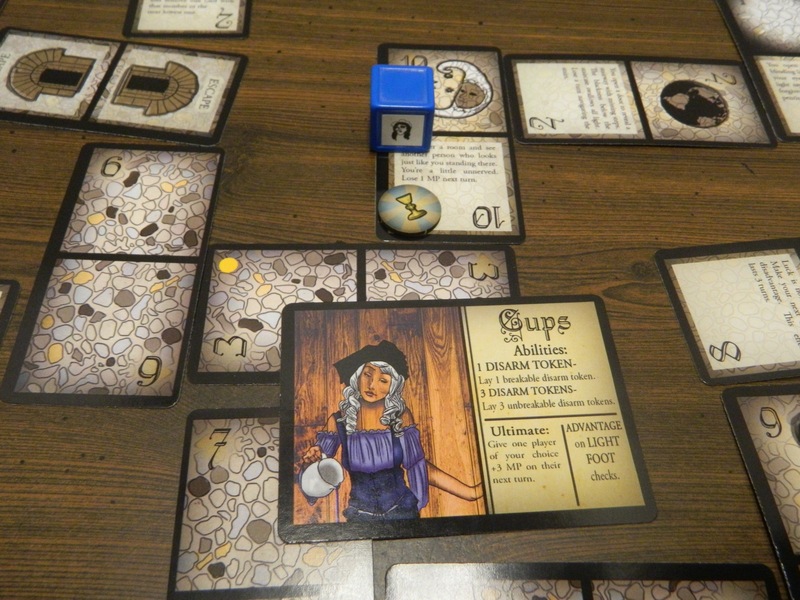 Thieves’ Company also kind of feels like a combination of a role-playing game and a cooperative game. The game doesn’t have the story telling aspects of a RPG (unless you want to tell the story of your thieving adventures), but the whole idea of rolling dice to see if different actions are successful reminds me a lot of tabletop RPGs. I actually liked this mechanic even though it adds a little luck to the game. If I had to describe Thieves’ Company I would say that it is a slow analytical game. When I refer to the game as being slow I don’t mean that as an insult or that the game is long. Most games of Thieves’ Company will probably take around 30-45 minutes (unless you take a long time deciding on what you want to do). Thieves’ Company is the type of game where you want to sit back and analyze what you want to do on your turn. It is not the type of game where you are going to just randomly decide what to do on your next turn. You need to plan out your strategy with your teammates. If you don’t think things out you could easily get trapped by the guards. At times Thieves Company kind of feels like a puzzle that you want to solve. As far as difficulty I would say that Thieves’ Company is in the moderately difficult category. None of the rules in the game are particularly complicated but there are quite a few mechanics so it will take some time in order to get a hang of the game. Your first game will mostly be a learning experience as you figure out the best way to play the game. For your first couple of games I think you will have to play against one of the easier difficulties. As you get more familiar with the game though you will get better at it and should be able to beat the higher difficulties. As far as an age recommendation the game doesn’t appear to have an official age recommendation. I personally would say that it is more of a game for older teenagers and adults. There is nothing with the game that would prevent younger players from playing it but I don’t see children understanding all of the different mechanics in the game. 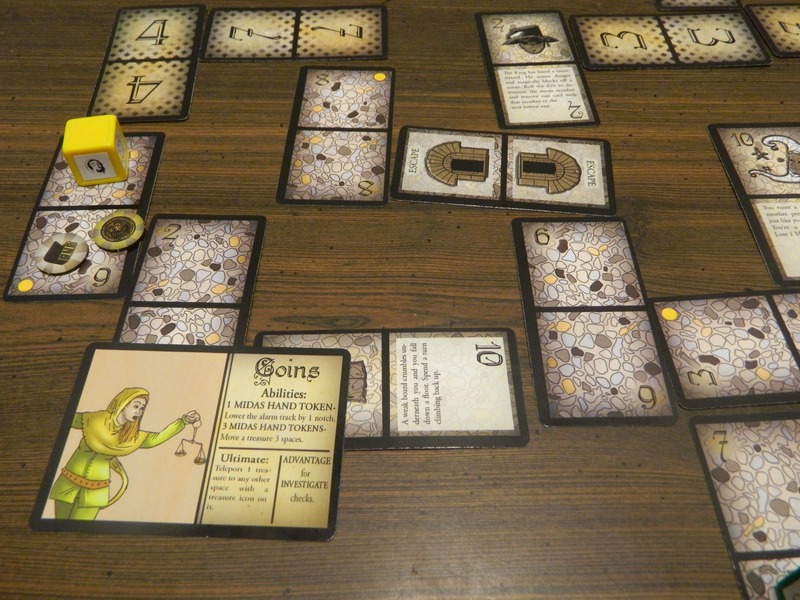 Thieves’ Company is also not the type of game that I would use to introduce people to cooperative games. I would suggest playing a more introductory cooperative game with them first and then moving onto Thieves’ Company because I feel Thieves’ Company is more in the moderate level of cooperate games. While on the topic of difficulty I might as well talk about how hard it is to win Thieves’ Company. Thieves’ Company has four different difficulty levels ranging from novice to elite. The different difficulties impact how many guards there are in the castle, at what level the alarm track starts, and how much gold the players need to steal in order to win. I have always liked the idea of the different difficulty levels as it makes the game easy to tweak based on how much challenge you want. I will say that the novice level is way too easy though. Basically the only reason to play the novice level is when you are learning the game or if you want to almost always win. Outside of making terrible moves or having very bad luck, you will not lose at the novice level. On the other hand I think the highest difficulty seems quite difficult where the players really need to know what they are doing and have a little luck in order to succeed. Unless you want a good challenge I think most of your time will be spent with the two medium difficulties. At this point I have only played the game with two players. I think Thieves’ Company is going to scale quite well whether you want a single or four player game. The rules are really flexible with the number of players adjusting both the number of guards and the size of the castle based. With more players you have more thieves and the players can discuss strategy to find the best way to approach a situation. With the type of game that Thieves’ Company is though, I think it would work quite well as a single player game. In a single player game you could play as one character or you could easily play as many characters as you want since it wouldn’t be difficult controlling all of the characters at the same time. One area of the game that I have some mixed feelings about are the thieves themselves. I love the idea of each player being a different character that brings something unique to the team. All four thieves have their own unique abilities that will help the group in their own ways. I think some of the thieves are more important than others though. I feel that the Thieves of Coins and Cups are more support characters so they are better for games with more players. To be successful in the game I think you are going to need at least one player to play as either the Thief of Swords or Wands and preferably both. You really need one of these thieves in order to help deal with the guards or you are going to have a hard time getting past guards that are in your way. One thing I have to talk about is the process of designing the castle. I really like that the castle is made differently for every game so you will face a different challenge each time you play the game. I have to say that you need to put some time/thought into designing the castle though. 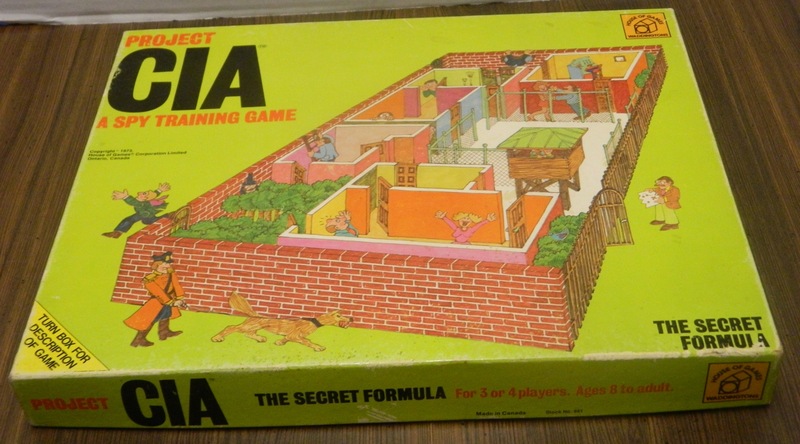 You might want to quickly put the castle together to get right into the game but I would advise against that. How you set up the castle will have a big impact on how successful you will be in the game. When setting up the dungeon I would recommend against just creating long pathways that branch off from the escape card. In the first game that I played my group did this and it caused problems because three of the guards basically got stuck in one wing of the castle and would never leave because they kept drawing cards that would keep them moving back and forth between a couple cards. This meant that the players couldn’t go into that entire section of the castle without having to fight off the guards. When laying out the castle you need to create multiple paths that connect to each other and really spread out the different card numbers to keep the guards moving throughout the castle. After reading the rules one of the mechanics that I was not sure of was the end game. I found it a little strange that the players could choose to end the game whenever they wanted even if they weren’t in the escape room. This seemed a little strange but it actually works for the game. What is interesting about the end game is that it adds a risk/reward mechanic to the game. If you have explored every card in the castle you know if you have already won so you can quit whenever you have acquired enough treasure. Usually you won’t be able to reveal the entire castle though. This becomes an interesting mechanic since you have to debate whether you think you have already acquired enough treasure or whether you need to keep pressing your luck and stay in the castle longer in order to get more treasure. This is an interesting decision since you can end up quitting too early or you could stay in the castle too long and end up losing by being captured. Component wise I would say that the game is solid. The only big complaint I have with the components is that I hope the alarm track is removed from the instruction booklet and made into a separate component for the final version of the game. It is kind of hard to reference the rulebook when you are trying to keep the alarm token on a specific space of the alarm track. This is a pre-release version of the game so this could be changed before the final version of the game. 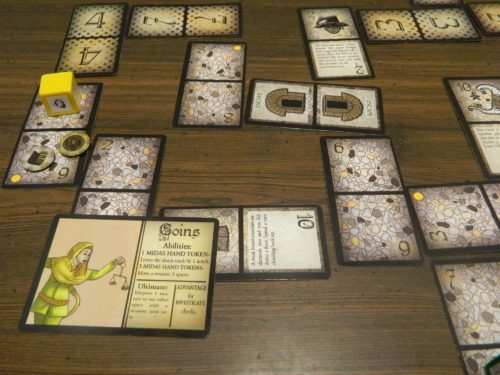 Overall Thieves’ Company is an interesting cooperative game. The game has some good ideas and is the type of cooperative game that gets better the more you play it as you develop a better strategy of how to move around the castle collecting treasure. Thieves’ Company has a couple small issues, mostly with guards getting stuck in certain parts of the castle, but the game has a lot of potential. 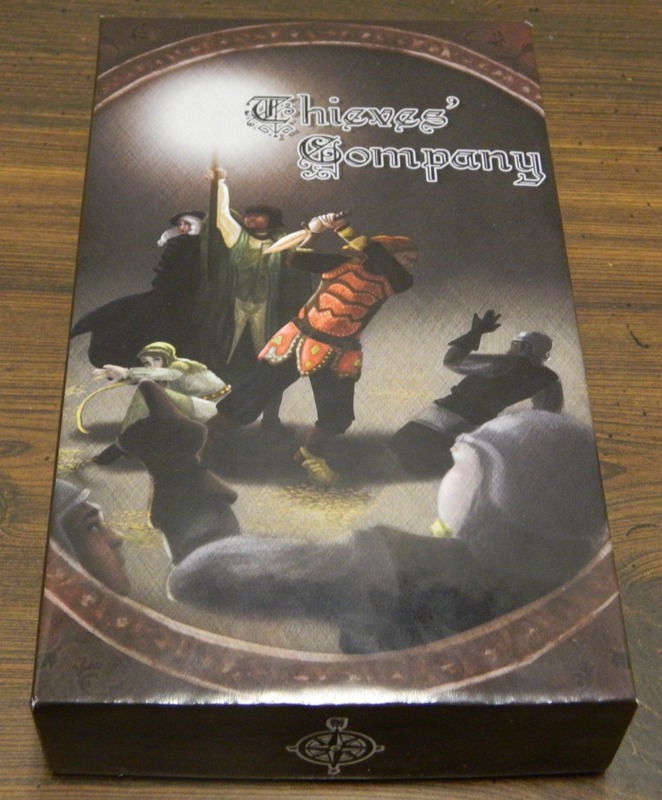 If you are not a big fan of cooperative games, Thieves’ Company is not going to be for you. If you are looking for a moderate level cooperative game and like the game’s premise, I think you should enjoy Thieves’ Company. Thieves’ Company’s Indiegogo campaign begins on November 1st, 2016. For more information check out Thieves’ Company Indiegogo page. An interesting twist on the cooperative game. Has a lot of flexibility and each game will be different. Takes a while to fully grasp. The guards have a tendency to get stuck in certain sections of the castle.